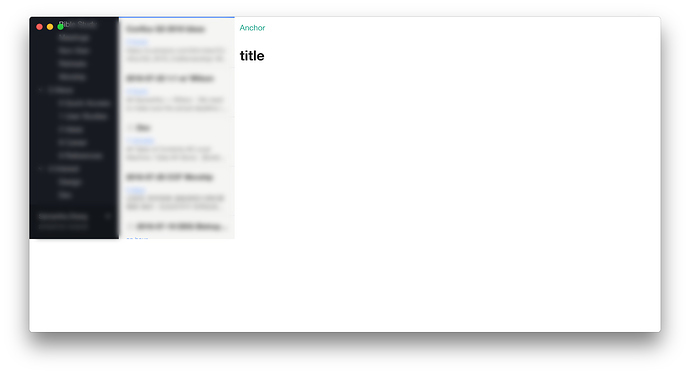 Clicking any anchor tag like (anchor tag)[#title] would cause the entire content to have extra padding on the bottom. And the entire top part of the app would become inaccessible until I force the app to refresh or use shortcut to put it back into edit mode. Actually, poke around a little bit more… Looks like it’s only breaking when toc is enabled, but it’s not working when toc isn’t enabled. Maybe I should change this post to a feature request and bug the developer for toc? Plugin coded, you can now generate table of contents by adding ‘table of contents’ or ‘toc’ to your markdown file. https://app.inkdrop.info/plugins/inkdrop-toc Do you have some code reviews advices? Great work! BTW, I will remove user-content- prefix in the next version so that TOC links in exported HTML works as well. Not sure how to set back MDEPreview.remarkReactOptions.remarkReactComponents.a Just restore the original A value: this.MDEPreview.remarkReactOptions.remarkReactComponents.a = this.OrigA I’m planning to remove jquery from the app dependency in the future. So I would encourage using vanilla JS API. Unfortunately, the author has deleted his account so the plugin is no longer maintained. It seems that not so few people uses TOC plugin so far. I will republish it as an official plugin later. Yey, working now. Thanks Takuya!